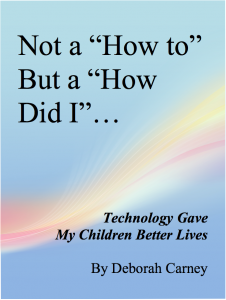 Not a “How to” But a “How Did I”…. I’m sitting here on a day that is a sad day for me every year. Nine years ago today, on Mother’s Day, May 13th, 2002, my youngest son was killed in a car crash. Every year on May 13th, I usually try to do something special that commemorates his life or helps other people. Today, what I decided to do is talk about how I got started on the Internet. Normally, I don’t do single podcasts by myself, so I hope this ends up being an okay podcast. I think it’s important for a lot of moms and dads to hear my story so that they can understand that their story, even though it’s maybe in a different time and place, we all have some very similar experiences. I want to talk a little bit about it’s a bit of a history lesson in how the Internet has changed how we deal with certain things in our lives. It all ties in with my starting a blog, DeborahCarney.com, which has taken me a long time to get to simply because it’s hard to talk about and write about certain things when you’ve had a lot of pain in your life. Again, I want people to understand, in my case, how technology has made a huge difference in a lot of aspects of my life. To go back to the beginning, I married young, 19 years old, had a daughter in February of ’77, and had my son, Chris, in July of 1978. He got really, really sick when he was seven weeks old and had to be hospitalized. They thought that he had meningitis. It made him it very weak. It acted as a temporary paralysis. They thought that that disease paralyzed him. He started on his path of recovery. In the meantime, life went on. He got to be about nine months old and he seemed to be getting stronger, and then all of a sudden, he stopped. He could pull himself up to kneeling, but he could never stand. While we were figuring this all out, I became pregnant again. I had my son, Daniel, in September of 1980. He wasn’t sick as a baby. In the meantime, now we’ve got Chris into physical therapy. He’s getting all this treatment for his so-called paralysis. Well, Daniel got to be nine months old, and all of a sudden, he couldn’t stand either. It was the same pattern. He could kneel, he could pull himself up to kneeling, but he never could stand. At this point in time, they decided to do muscle biopsies. I was going to see a specialist. We were in Rochester, New York. The University of Rochester Strong Memorial Hospital is a big research hospital, great doctors, the best place to be. I had a doctor that was very frightened to give me the results of the tests. He wouldn’t give me any results. I got him on the phone. He was like, “No. I need you and your husband to come to my office together so that I can tell you together.” I’m like, “My husband works second shift. It’s hard for him to take off time. Just tell me what’s wrong with my children.” He finally said, on the phone, at 5:00 in the afternoon, he said, “Your children have something called spinal muscular atrophy.” I said, “Thank you very much,” and I hung up the phone. I got enough research at that visit to be able to go home and do some more research on the computer. I had a Commodore 64 computer. Now we’re talking, this is by now, this is 1981, beginning of 1982. Back then, it was the 2400-baud modems that you stuck on the telephone cradle. I happened to be pretty good with computers already. I knew how to find things online. Back then, there was no Worldwide Web. There was an Internet and it was used by schools and universities. I happened to be able to be into that. I knew about BBSs and I knew who to call. I knew how to research on that Internet. I went online and I found a place that was a database for businesses during the day, but in the evening, you could pay $20 a month, and you could do research. There were no full texts back then. The research available online were all abstracts from medical journals. The next time that I went to the doctor’s office, I had a stack, because I had used this knowledge base to pull up references to spinal muscular atrophy. I knew what it was. I knew the most current research on it. I knew that it was autosomal recessive. I knew that it was a one in four chance that any of my children could have it. I just happened to have two out of three that had this condition. We all have things that happen in our lives that we can take control of. Because of the Internet, and because of the technology that’s available to us, we don’t have to listen to just what one doctor says. We can grab knowledge without having to rely on just one person. I guess if there’s anything I want you to get out of my telling you this story is that if you’re diagnosed with a medical condition and you think it’s the end of the world, go do some research. We’re going to have some other guests on Blogging ABCs that are going to explain how, more recently, they were able to do research and start blogs about their children’s medical conditions or their medical conditions. Now, because I was able to do my research, we had an excellent physical therapist that came out and I gave her copies of the research. She treated my kids. I guess I should back up. Spinal muscular atrophy is a muscle condition where the nervous system stops developing at a certain point in time. For the parents of you that are out there, what that means is when you watch a baby develop, as they get to six months, certain muscles are working and nervous system. You can see it go down their body. My children’s nervous systems stopped developing at nine months old. Their muscles and their bodies continued to grow, but their nervous system didn’t trigger and tell the muscles what to do. They were able to sit. They were able to be in wheelchairs. They were able to write and feed themselves. Their minds were not affected. Actually, Daniel was quite brilliant and Christopher was a talented actor. I found out a lot of things. The physical therapist, instead of treating them like kids that were going to die young and that weren’t able to use their muscles, she was one of the people that was at the cutting edge of using things like electro-stimulation to try and get their muscles triggered off to start working. We did aggressive physical therapy with them, which a lot of parents criticized us for. I knew a lot of parents because we did physical therapy at the local United Cerebral Palsy Association. That was where everyone, no matter what your medical condition was, went to have your physical therapy and parents would meet and talk. Some parents didn’t agree with my philosophy and my physical therapist’s philosophy of having aggressive physical therapy. They thought, “Well, my child has a limited life span. I don’t want to do anything that’s going to hurt him. I want him to just be comfortable.” That was their choice. That is something that is really important for people to understand, is that there isn’t a right choice and a wrong choice, as long as you do your research, you know what you’re doing, and you know how that’s going to affect your child now and in the future. We were doing things that no one else had done with kids with spinal muscular atrophy. We didn’t know how it was going to turn out. Through the years, my sons required some surgeries and they were ill and had hospital visits. We would see some of the other kids and they would be physically in not as great shape as my kids. Yet, they were still happy in their own right. I just think it’s so important for parents to know that they shouldn’t rely on just one doctor. They shouldn’t rely on just one opinion. They should be out there looking, talking. Back then, I didn’t like to go to support groups, because let’s face it, my daughter is in preschool and in kindergarten. I’ve got to take the boys to physical therapy and to occupational therapy. I have doctor’s appointments. Then we have to take time out for surgeries. In the meantime, I’m a professional wedding photographer that works every weekend. My husband is someone who works swing shift, so he’s not always around. We don’t have time to go on a Wednesday night and go sit down with a group of other parents and talk about our children and how we’re handling the process of finding out you have a handicapped child. You go through the exact same 4 step process that you do if you’re grieving when you find out you have a child with a drastic physical disability. One of the things that has changed is that now, you folks that find out your kids have a disability, you can go find support online. You can go find bloggers and you can find people on Facebook. You can talk to other people and you can listen to other people. You can find out different treatments and different ways that parents deal with things. What do you do if your bathroom is too small? What do you do if you need a certain type of equipment? We were one of the first people to use Dragon Naturally Speaking. Back then, it was $900, and PCs were still very expensive. My son was a writer and he started dictating, using Dragon that was supplied by the school. It’s just so important to see the differences. We were a very vocal family. We didn’t go to support groups. We connected with the Muscular Dystrophy Association in Rochester, which spinal muscular atrophy is also the children’s form of Lou Gehrig’s Disease. If I told people that my children had a form of Lou Gehrig’s Disease, they could understand that, or if I said, “one of the muscular dystrophies,” they could understand that. For many years, we were spokespeople for the Muscular Dystrophy Association. They supplied us with a ramp to the house, with equipment that we needed, and they paid for some of the physical therapy. We fortunately had very good medical coverage at the time, which as years went by, medical coverage wasn’t quite as good, but we still had other funding sources. My kids, including my daughter Elizabeth that many of you may know, we did public speaking constantly. Elizabeth has been on television since she was seven years old, in front of the camera telling people what it was like to have her brothers with disabilities. There’s a lot of focus on kids with disabilities and then people forget the siblings. We were very cognizant and the people that we dealt with were also very cognizant of making sure Elizabeth was included in everything that we did. I’ve got to tell you, we made quite an entrance when we came in somewhere because it wasn’t just one young man in a wheelchair. There were two kids in wheelchairs, plus their sister, plus myself. We got the word out there. We did a lot of disability advocacy. I know that other people are still doing that to this day. I have stepped back from that role because of recent things that have happened. I do want people to understand that even though this was 20 years ago, 30 years ago, sorry, losing track of time, through my children’s lifetimes, they gained a lot through online interaction through forums. Christopher was a big game player in GemStone. He was an actor in real life and he was an actor on the computer. It’s just so important for people to share these experiences with each other, so that you don’t feel like you’re all alone. Again, this podcast is a little longer than what I would normally record, but I’m hoping that it reaches someone out there and lets you know to not give up and to do your online research, find some online support. Find an organization that fits your lifestyle, that can help you and that can help you spread the word about disability awareness. That’s part of what the blog DeborahCarney.com is going to be about. I’m going to start sharing more stories about my children, how we did public speaking, how we raised awareness back then with regular websites, there were no blogs yet, and eventually how I came to make a living online totally, partially because I needed to be at home. As they got older, I needed to not work outside the home. Debbie, we went to 43school and graduated from jeff. I’m not sue that you rememberme or not. I do remember you always loved photography. I also remember your boys when they were on Jerry Lewis telethon. I wished I would have reached out to you then. I admire how diligent and strong you have been. I can’t even imagine dealing with all your hurdles and the passing of your sons. I hope you are at peace for all you did to make their lives better. This is wonderful that you are willing to share your life with others that are going thru what you already have have experienced. Thinking of you!